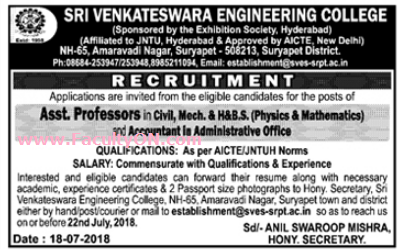 Sri Venkateswara Engineering College, Suryapet has advertised in the DECCAN CHRONICLE newspaper for recruitment of Teaching Faculty- Professor / Associate Professor / Assistant Professor jobs vacancies. Interested and eligible job aspirants are requested to apply on or before 22nd July 2018. Check out further more details below. About College: Sri Venkateshwara Engineering College, Suryapet is established during the academic year 1998-99 with approval of AICTE, New Delhi and Government of Andhra Pradesh. The institution is affiliated to Jawaharlal Nehru Technological University, Hyderabad and is sponsored by Exhibition Society, Hyderabad. How to Apply: Interested and eligible candidates are requested to send CV along with copies of certificates and PP size photos to the email address or postal address given below or submit by hand.